Toast Art. It’s a Thing. Beet Hummus & Egg Toast: I started out with a beet hummus from Trader Joe’s and layered one sliced hard-boiled egg with Persian cucumber slices. I then topped it with a little salt and pepper, a sprinkle of micro-greens for extra concentrated antioxidants and a few roasted sunflower seeds. The bright pink beet hummus makes everything look gorgeous! This one is quite filling and has a great balance of protein, fat and carbs! I’d say the flavors are earthy with the perfect amount of crunch and nuttiness. Nutella & Raspberry Toast: Moving over to something a bit dessert-y, I whipped up a Nutella toast for friends, since I don’t eat chocolate. But I know chocolate and berries go really well together, so I had to make it, even though I couldn’t eat it. All you have to do is start with a light smear of Nutella and place any kind of berry on top. I grated some Lily’s sugar-free chocolate on top and sprinkled with a few crushed raw almonds for crunch. Honey-Almond Apple Toast: This one is so simple, and you probably have all the ingredients at home! So as soon as you’re done reading this, go give it a try! 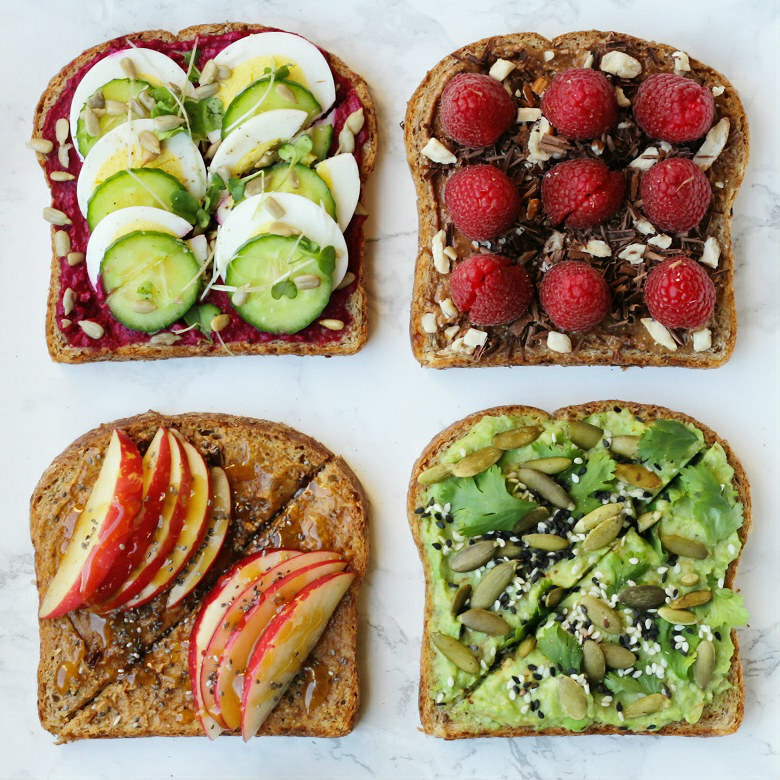 Just use some almond butter and honey, sliced apples and chia seeds to make this comforting toast. But it doesn’t stop there! Some roasted, salted pistachios round out this flavor profile, because c’mon, who doesn’t love apples and nut butter plus more nuts?! The honey just gives it a dessert-feel without being overly sweet, and the chia adds a little crunch and fiber. YUM! Avocado Pepita Toast: Healthy fat and buttery goodness…that’s what I think of when I think of avocados! Just fork-smash about 1/2 of one small avocado and top with pepitas, white and black sesame seeds and cilantro. Crack some fresh sea salt and pepper on top, if you like, or squeeze on some fresh lime juice! This is another combo that’ll keep you full for hours! Goat Cheese Tomato Basil Toast: Slice about 6-7 mini heirloom tomatoes (they’re the sweetest) and toss with sea salt, pepper, garlic powder and 1 teaspoon of extra-virgin olive oil. Spoon over your toast and sprinkle with about 1 ounce of goat cheese and several fresh basil leaves. You could probably add kalamata olives too if you like a salty punch! I like the tangy sweetness of the tomatoes with the creamy bitter cheese and fresh basil! Island Toast: This one is like a party in your mouth! Cashew butter gets spread over the toast, and then you top with banana coins, toasted coconut and thinly sliced fresh pineapple. OMG! It’s creamy, rich, sweet, tart and crunchy all in one! Which one would you make first!!?? Ah, it’s too bad I dont eat grains! Of these, the ones that look the most amazing to me are the raspberry one, the tomato one, and the avocado one! So good! Make this a cheap clan eats please! The pictures are gorgeous! And the food looks so Instagrammable. Gonna try some of these recipes out.